Diamonds have fascinated mankind from Confucius (Better a diamond with a flaw than a pebble without one) to Zsa Zsa Gabor (I never hated a man enough to give him his diamonds back). They are the exemplary gift of choice for engagements, anniversaries, Valentine’s Day, Mother’s Day and a host of other special and celebratory occasions. Because it’s virtually impossible to get through life without buying a diamond, or, at least, dreaming about having enough money some day to buy one, we offer the following sparkling primer in hopes your purchasing decision will be as brilliant as the gem itself. For the utmost clarity on the subject, LaVerneOnline consulted Phillip Sigal, owner of Sigal Diamonds in downtown La Verne. To reveal your diamond’s true color, perform a simple paper test, Sigal suggested. Simply place the diamond that has caught your eye in a small folded piece of white paper about the size of a business card. The diamond should appear white to the naked eye. A diamond with a yellowish or brown tint will easily be revealed for what it is in this simple test, especially when diamonds of different quality are placed side by side in the paper. Conversely, never judge a diamond’s color against a black background. A black, velvet background against which the stone is displayed may appear elegant, but appearances are deceiving. Remember, the highest-quality diamonds are “D” through “H” and nothing below. Diamonds are typically set in gold or platinum, but Sigal feels gold is best because it is shiner and doesn’t nick or dent as easily as platinum. If buyers like a more yellow white gold, 18 karat gold is recommended; if they like a whiter gold, 14 karate is recommended. By contrast, platinum rings are often rodium-plated, a machined process designed to give platinum a shiny 14-karat look. Unfortunately, the coating begins to wear away after a few months, Sigal said. Clarity: Diamonds with the fewest flaws have the highest value and quality. Flaws are things like black carbon spots, air bubbles, cracks or fissures. Ask your jeweler for a loop to examine the diamond and how to use this magnifying glass if you haven’t used one before. If you see a crack with a loop, but can’t detect it with the naked eye, the diamond is still a good stone. When purchasing a diamond larger than a quarer carat (.25), it’s important to ask your jeweler if the gem has been “Yohoda” treated or “Diamond Enchanted.” These treatments fill the cracks with melted silicon, concealing defects and imperfections that not even a loop can detect. Many sellers will not volunteer this information unless you ask. So ask! As with the color of diamonds, the clarity of diamonds is also rated. Interestingly, a flawless or perfect diamond should never be set in a ring. Rather, it should be sealed and stored. “Once you set the stone, you scratch it,” Sigal said. To determine a diamond’s true color and clarity, never purchase a piece of jewelry where the center stone is already set in the ring, Sigal advised. “If the stone is already set in the ring, you cannot tell the color and you cannot tell if there’s a flaw under one of the prongs,” he said. A final note about clarity: If you’re buying earrings or pendants, clarity is slightly less critical. “That’s because with a ring, somebody is going to say, ‘Oh my God, what a beautiful ring,’ and pull the ring close to them to see the diamond,” Sigal said. “If they see a crack or black imperfection, they’re going to ask, ‘What’s that in the ring?’ That’s why you want a ring where no flaws are apparent.” Remember, decent clarity can be found from VVS1 to S13. Carat Size: In diamonds, as in so many other facets of life, size matters, but not if it means sacrificing quality. “You’re better off having a small stone that is good than a big stone that is bad,” Sigal advised. “A one carat (100 points) diamond is the magic number in the diamond industry. 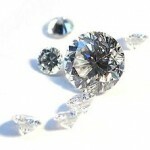 As size increases above the one carat standard, prices increase tremendously. Cut: Diamonds can be cut by hand or machine. The difference is not important; the cut, however, is. When a round brilliant diamond has been cut to “Ideal” proportions by a master cutter, it is a splendor to behold. The Ideal cut diamond describes a round brilliant diamond that has been cut to exact and mathematically precise proportions. Its symmetry, with 58 exactly placed facets, produces the ultimate in luster and beauty. When a diamond is cut to the ideal proportions, all light entering from any directions is totally reflected through the top and is dispersed into a display of sparkling flashes and a rainbow of colors. Diamonds are cut into a variety of shapes with the most popular being Round Brilliant, Marquise, Pear, Heart, Oval, Emerald and Princess. The price of an Emerald-cut diamond is less than other shaped diamonds because it has fewer facts, and hence, less brilliance. Interestingly, diamond cutters began producing diamonds with 58 facets around the mid- to late 1940s. Diamonds cut before this period have fewer facets, and these antique diamonds will have less brilliance, accordingly. Cost: You get what you pay for. “Diamonds are a commodity like gold,” Sigal said. “If you can buy one gram of gold for $5, it is impossible mathematically to be gold. If someone offers you his Rolls Royce for $100, something is not right. You can’t buy a $5 bill for $4.” A decent one carat diamond ring meeting the criteria discussed above “cannot be purchased for under $4,000,” according to Sigal. “Anything below that price, definitely check the color and clarity because there’s definitely a problem,” he added. Common Sense: Purchase your diamond from a reputable jeweler who comes highly recommended. Be wary of of retail stores in malls with high overhead and markups. Be crystal clear about the store’s return, exchange and upgrade policies. A good quality diamond should hold or increase in value. Therefore, a reputable jeweler should be willing to take back the diamond at the purchase price and apply that price toward the purchase of another diamond. Again, that’s why consideration of color and clarity are so important when purchasing a diamond. “If it’s a bad stone, it’s a bad stone, and nobody will take it back,” Sigal said. Buying a diamond should always be a happy occasion. If you follow a few common-sense rules of buying quality diamonds, your diamond should provide you a lifetime of pleasure and beauty. Diamonds, after all, are forever!